Sports betting is entwined with the global marketplace. Thanks to advances in technology, the average punter has the unfettered ability to wager on sports 24 hours a day, 365 days a year. There was a time when punters were limited to betting whenever there’s a specific sports season. However, in the contemporary world, online sports books accept wagers on different sports from all over the world. If a country has a major sporting organization, then you have an opportunity to wager on it. 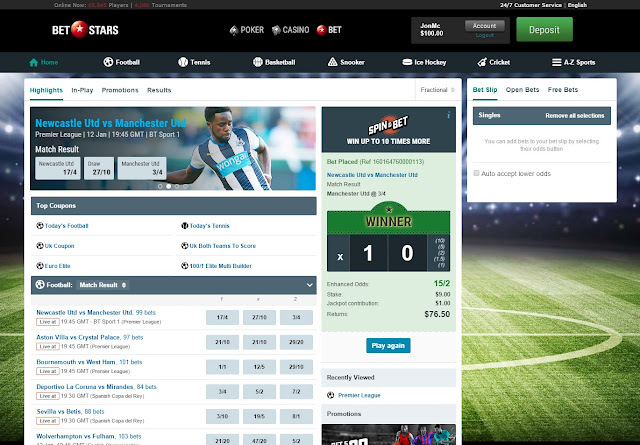 As a result, the entire global marketplace allows punters to wager on contests at all hours of the day - whether it is tennis matches in Australia, or cricket matches in India, or rugby matches in England, or football matches in Germany, or basketball games in America, or soccer tournaments in Latin America, or even ice hockey games in Canada, the internet provides. Who doesn’t love a “game changer”? Every generation, someone or something comes along that revolutionizes a particular sport. That revolutionary player, or coach, or philosophy alters the playing field for generations to come. According to the recently released ads, new sportsbook website BetStars is attempting to create a “game changer” of its own by introducing a new mechanic for betting called “Spin & Bet”. This new product is clearly evoking the spirit of “Spin & Go”, a popular option with poker players on BetStars’ sister site PokerStars. In 2014, PokerStars introduced Spin & Go, an optional mechanic in which poker players could buy into a three-handed Sit & Go tournament and a special spinner would determine a bonus that would juice up the prize pool with a special multiplier. The Spin & Go events have an added lottery feature, so it's an additional layer of gambling excitement for the participant. Spin & Go has been a remarkable success for PokerStars, and it's a promotion that they continue to run. Although initially dismissed as a gimmick, Spin & Go became increasingly popular over time. During 2015, PokerStars ran a special $1 million Spin & Go promotion. In total, 14 different players became instant millionaires. Online poker, especially the sit-and-go format, is vastly different from sports betting. However, BetStars introduced a modified version of the same idea called Spin & Bet. The spirit of Spin & Go is still intact. Spin & Bet offers a unique twist on the outcome of a wager. It is basically the same concept as Spin & Go, as the Spin & Bet option allows the player to increase their winnings with a prize pool multiplier. 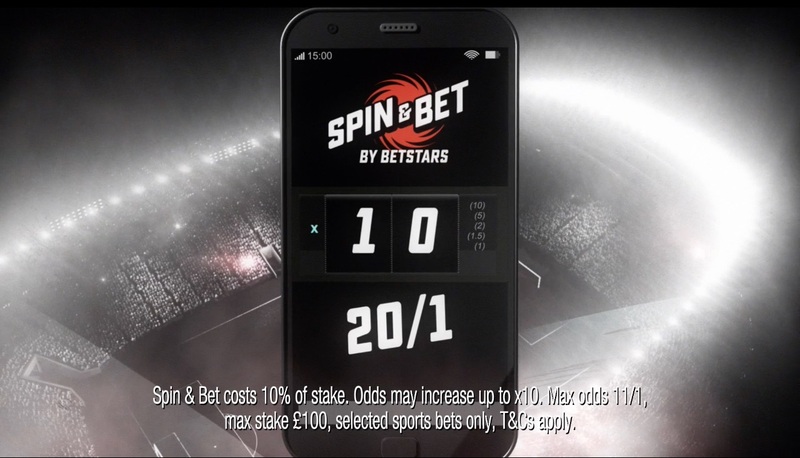 With Spin & Bet, a player could win up to 10 times the amount of their bet. For example, a £100 wager on could balloon into a £1000 windfall. To participate in a Spin & Bet, a player has to pay a fee that's 10% of their initial wager. For example, a £10 bet is really a £9 bet if you decide to partake in Spin & Bet. Go to the BetStars homepage or open your iOS and/or Android BetStars app. Select a wager from the available sport markets. Click 'SPIN & BET'. An animation will display your potential enhanced winnings in one of the multiples: 1x, 1.5x, 2x, 5x or 10x. If you win your bet, then you win the enhanced amount. It’s that easy. Example 1: You place an £10 wager on an accumulator for a trio of Premier League You pay your 10% fee or £1, so your wager is £9 which pays out £30 if your accumulator wins. After you click on Spin & Bet, the animation displays your enhanced winnings: 5x. So now you have a chance to win £150 (or £30 x 5). Example 2: You place a £20 wager (actually £18 minus 10% or £2) on the Cleveland Cavaliers in the NBA. If they beat the New York Knicks, then you will win £18. After you click on Spin & Bet, the animation displays your enhanced winnings: 2x. If Cleveland wins, then you will win £36 (or £18 x 2). Only time will tell if bettors will pursuit the Spin & Bet option as enthusiastically as poker players embraced Spin & Go. However, if you decided to try it, don’t forget to do your homework on who to bet.